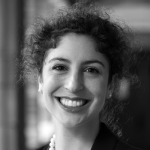 D&S lawyer-in-residence Rebecca Wexler describes the intersection of automated technologies, trade secrets, and the criminal justice system. For-profit companies dominate the criminal justice technologies industry and produce computer programs that are widespread throughout the justice system. These automated programs deploy cops, analyze forensic evidence, and assess the risk levels of inmates. But these technological advances may be making the system less fair, and without access to the source code, it’s impossible to hold computers to account.